Ok let me get this out of the way right away. I am from the UK and over here we call baseball rounder’s. While I will fully admit my knowledge of professional baseball could be written on the back of a postage stamp. I have actually played a great deal of baseball games in my life. 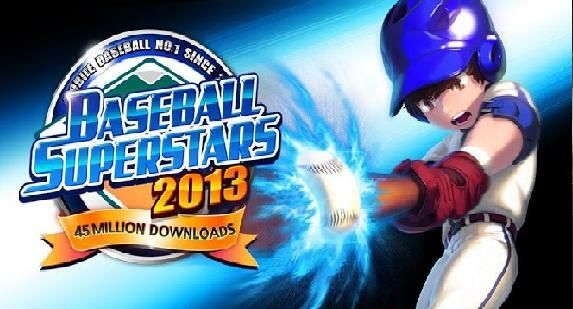 Baseball Superstars 2013 is part of a series that so far has the better part of 50 million downloads. But to tell the truth Baseball Superstars is not your average baseball game. Baseball Superstars 2013 looks great. I was actually a little shocked at how good this game. It has a nice cel-shaded style of graphics. I am loving that so many games are using this art style as it really does make iOS games stand out from console games. When you fire up Baseball Superstars 2013 you will be asked to select your teams jersey and pick a logo. Or if you are someone who has a little artistic talent you can create your own. Once this is done you have a very important decision to make. Do you want to play My Batter or Pitcher Mode. Both of these modes as I am sure you will guess are very different. In My Batter mode which I picked first. You are given three chances to hit the ball and then you have to watch the rest of the game unfold. I can hear you now saying brutal, but the rest of the game happens at super hyper fast speed so your not waiting around to long. If you pick the Pitcher Mode you get to pitch the ball. I found this mode a little better if I am honest as it felt like I got to do more than in the batter mode. Again though when your not having a turn you just watch the rest of the game. What I found really amusing is that it is so hard to know what the heck is going on and then BAM you have either lost or won. There are many different in app purchases for you, but the good news is you can play this game without ever spending a penny. And perhaps the best news of all is there is no time limit. So you can play this for hours on end. This comes as a nice change of pace. I really thought that there would be some time frame I would have to wait for before I could play another game. But thankfully that is not the case. And that is good because if you really want to get into this game you will need to spend hours. You see this is no ordinary baseball game. As a mater of fact it has as much in common with a RPG style game as it does a baseball one. In between baseball games you will be required to do quests, train your players and even take some quizzes. There is a great variety to the game play that you never really get to the point where any one element gets boring. Baseball Superstars 2013 is a great little game. And the fact that you can play through it without spending a dime is always a good thing. Do not just think of this as a baseball game think of it as a RPG game that is just set in the world of pro baseball. I am sure if you are a baseball fan that you will appreciate it more however. But even for a non fan like my self there is more than enough fun to be had here.